In the summer of 2008 my wife Dorothee and I visited the U.K. for several weeks. We rented (or “hired” as the Brits would say) a car, and traveled the length of the country, from Brighton Beach to Edinburg, Scotland. My gearhead radar is always on full alert, of course. During the course of our travels, we spotted several iterations of the quirkiest car we had ever seen, with not a clue as to its origin. On more than one occasion we attempted to give chase to learn more, but in every case, we were outsmarted. Finally, we arrived at the southern coastal village of Chichester, just a few miles from Lord March’s estate, and the location of the Goodwood Festival of Speed, which had been the primary purpose of our travels. While staying in a small mom-and-pop B and B there in Chichester, I mentioned to the matron of the house our sighting of this mysterious car, and described its appearance. “Oh” she exclaimed, in finest southern British accent, “that sounds like a Figaro”. 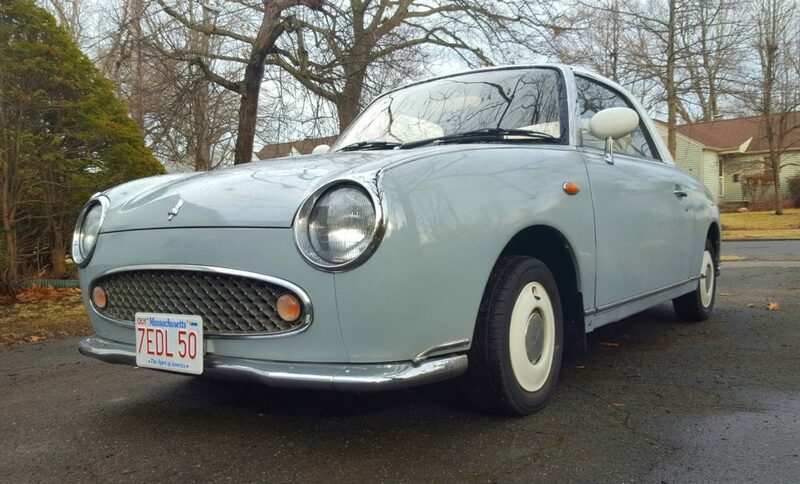 Turns out, she remembered having seen one posted for sale at a local used car lot in the same village, so we wasted no time heading down there, where we were privileged to be able to see AND DRIVE a Figaro first hand. 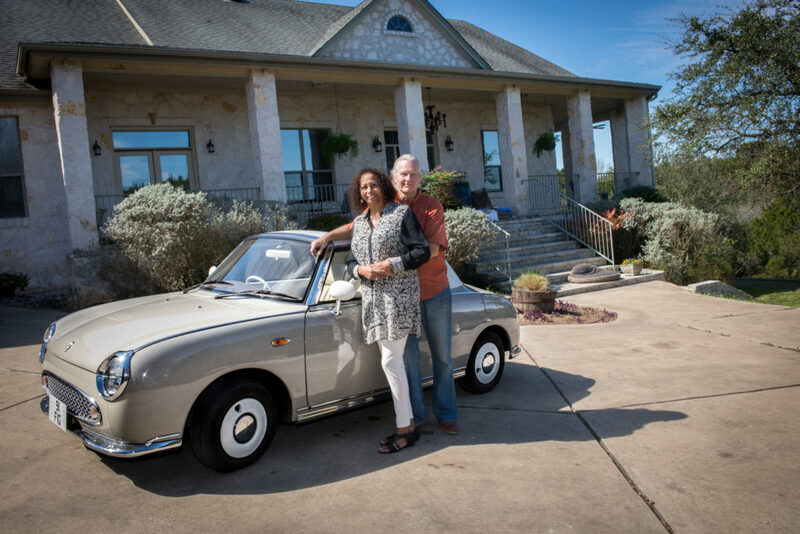 It was love at first sight, and we were prepared to immediately plop down the purchase price, only to be brought back to the reality that US regulations require a non-US-certified vehicle to be at least 25 years old before it can legally be imported into the US. This began our painfully long 8 year odyssey as a precursor to importing our own Figaro to the states. 2016 was the magic number, as that is the year these built-only-in-1991 Figaros could legally be imported to the US. In late 2015, we began researching possible sources for OUR Figaro, and, ultimately, based on glowing reviews posted on the UK Figaro Owners Club website, we settled on a little shop just northwest of London called, appropriately, The Figaro Shop. 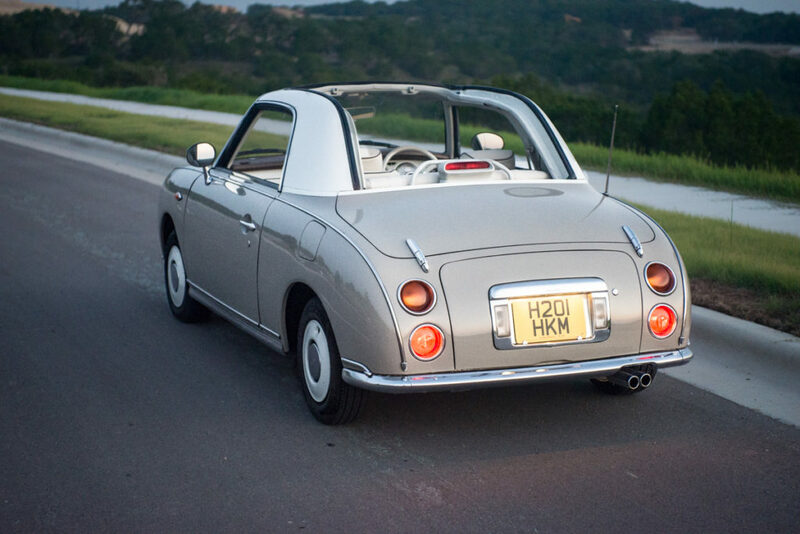 It is there that owner Toby Bryant, and his group of British craftsmen, focusing solely on the Figaro, source a solid used Figaro for their client, then subject it to an exhaustive 50-point restoration program, the end result of which is a vehicle as close to new as could be possible for a 25 year old car. 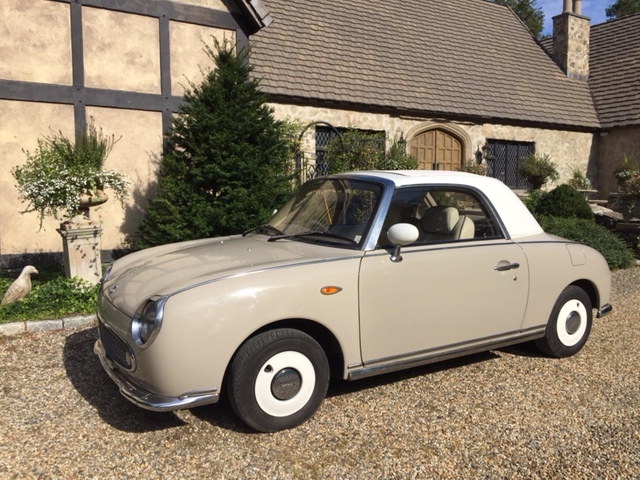 To celebrate our new garage queen, we decided to travel again to England, and participate in the Figaro Owners Club 25th anniversary celebration, held at a quaint English hotel near Stratford-on-Avon, where some 250+ Figaro’s converged on display for a weekend celebration. 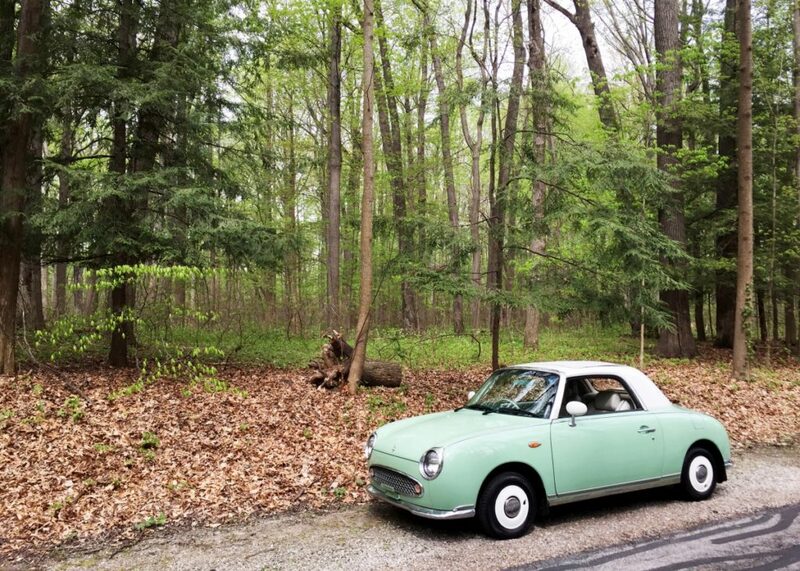 It was in June of 2016 that we first laid eyes on OUR Figaro, beautifully refinished in its original (and our chosen) color of Topaz Mist (well, I’d call the color “Latte”), and looking, for all the world, like a brand new car. 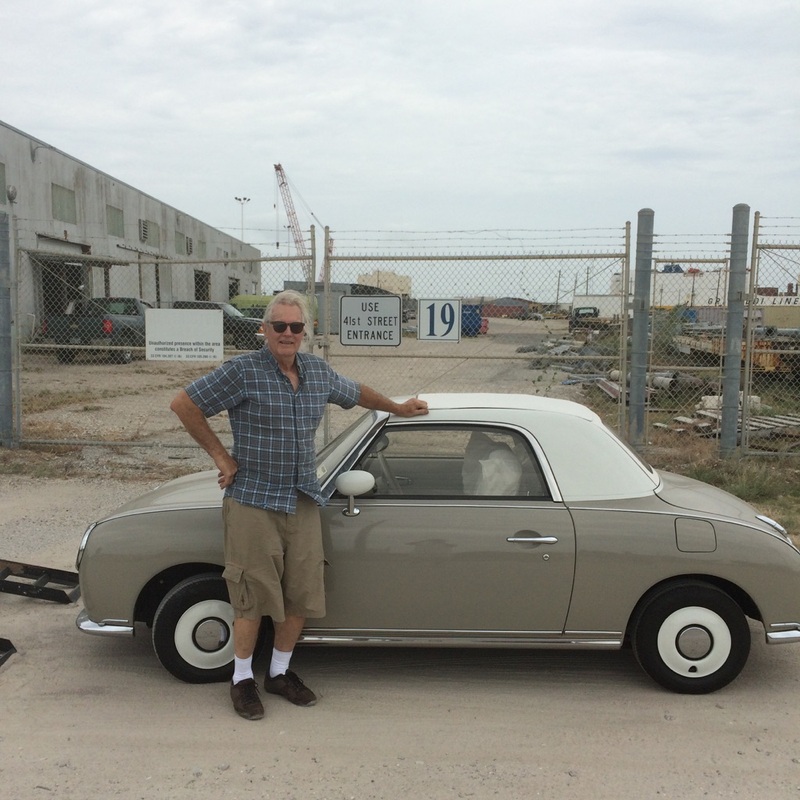 Shortly after our own departure from England, our Figgy was loaded on board a ship at Southhampton Harbor, bound for Galveston Port, in South Texas. Our Figgy was built on July 1, 1991, and it landed at Galveston on July 27, just 4 weeks “under the wire” of minimum age required for importation. Since then, we’ve had many opportunities to enjoy our own Figaro. Every outing inevitably results in conversations with bystanders who are universally fascinated by the car, as are we. It is refreshing to actually acquire a 25 year old car that absolutely needs nothing, and is ready to just be driven and enjoyed. We fully expect to have many happy future experiences. and current all at the same time. but the Figaro was never far from our thoughts. imported one. But we kept learning and working thru. completely original right down the mats. Not a speck of rust or damage. Royce and a 1955 Bentley, which we restored, and a 1955 Silver Dawn. cannot say enough about this little gem and it is worthy of every platitude. I have wanted to surprise my wife with a small and unusual car for a long time. This situation recently came to a head when I started borrowing her car more often for my four-day work trips. 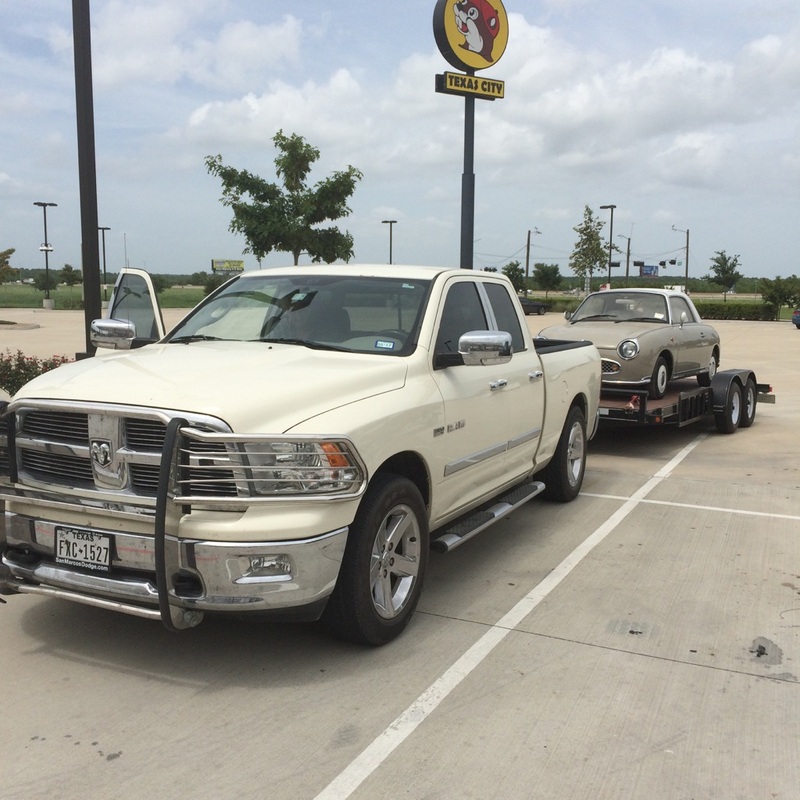 We needed a backup car. I know she’s always like the Nash Metropolitan and I looked at them several times through the years. It finally hit me that these cars are about six decades old now, which explains why every one I found was either a rust bucket or severely overpriced. Even the best maintained Metro is likely to be a string of problems, and I don’t even want to think about the crash test standards in effect when the car was designed. I had to find another option. About this time I started watching Mighty Car Mods, a YouTube channel on which two enthusiastic young Aussies play with cheap and cheerful cars. In an early episode a Figaro is obtained. I looked into import rules and my timing was lucky; the 25 year exemption had just kicked in. 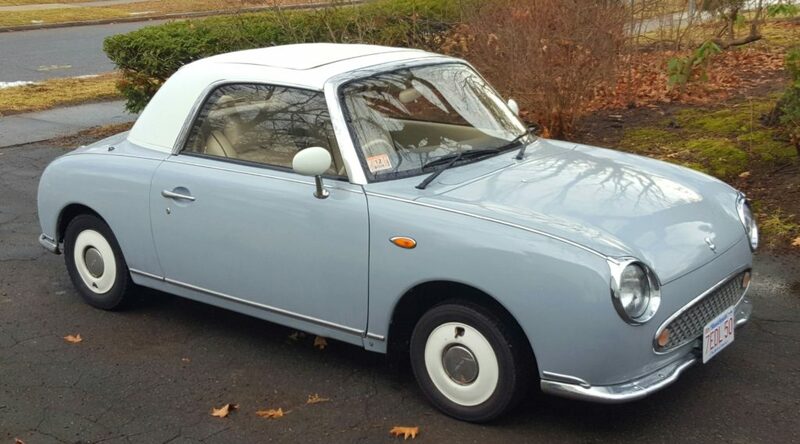 I found Figlet on ebay. An expat Brit has imported a few Figs and Land Rovers to Georgia for resale. This one was touted as “restored” and with the claim “everything works as it should.” Well, let’s just say Buyer Beware. 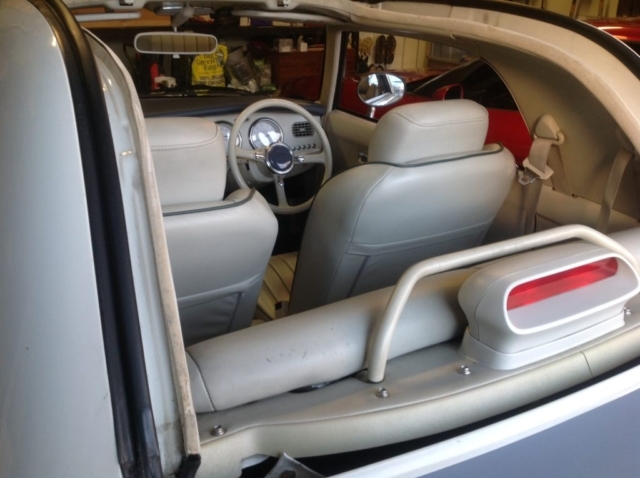 Although the car was repainted and reupholstered, the work is a bit slap-dash. And there are numerous issues with the car from an upkeep standpoint, not the least of which is a big exhaust leak. There are numerous oversprays from the poorly-masked paint job, the radio doesn’t work and is missing controls, the roof latch warning sounds continuously, etc. There are some rust areas to deal with and some broken interior trim panels, which the seller managed to creatively avoid in his photos, despite my specific request for shots of any problem areas. 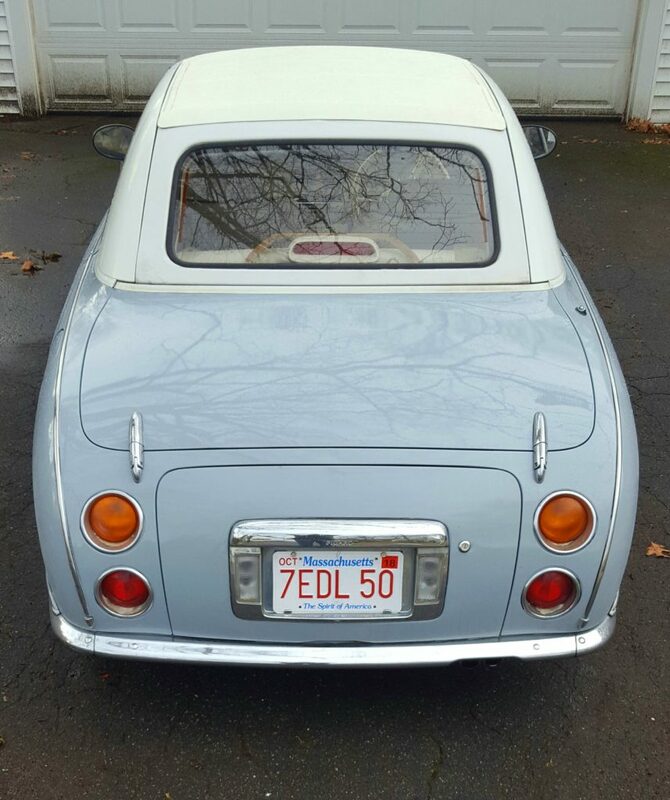 Clearly I’m disappointed in the seller, but I’m very happy to have the car despite the problems. The problems continued with the shipping of the Fig from Macon to Springfield. I seem to have hired Larry, Moe and Curly for the transport job. Eventually we got the car delivered, registered, and inspected and will put on winter tires in a few days. I plan to gradually freshen up the car with new hoses, brake pads/liners, shock absorbers, floor mats, some new interior panels, missing fasteners, upgraded radio and speakers, and lots and lots of cosmetic work. I will clean up the engine bay and repaint the valve cover, replace the accessory belts, timing belt, water pump, distributor cap, rotor, plugs, ignition leads, and change the fluids. I’ll remove, pressure-wash, and re-dye the carpet. The interior panels will be cleaned, repaired, and painted. 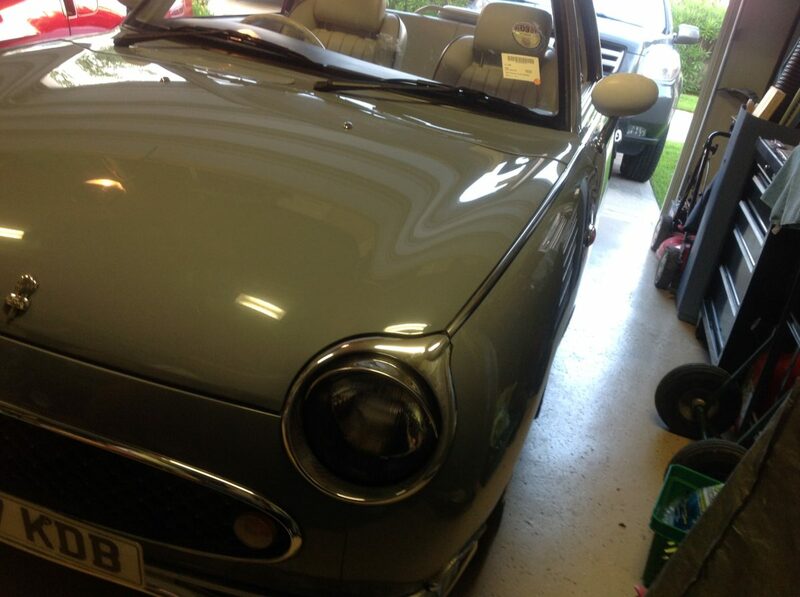 Eventually I will wet sand the orange-peel paint job (thank goodness it’s a very small car!) and have a new clear coat sprayed. In the meantime, we have the coolest little runabout in town. Can’t wait for top-down weather! 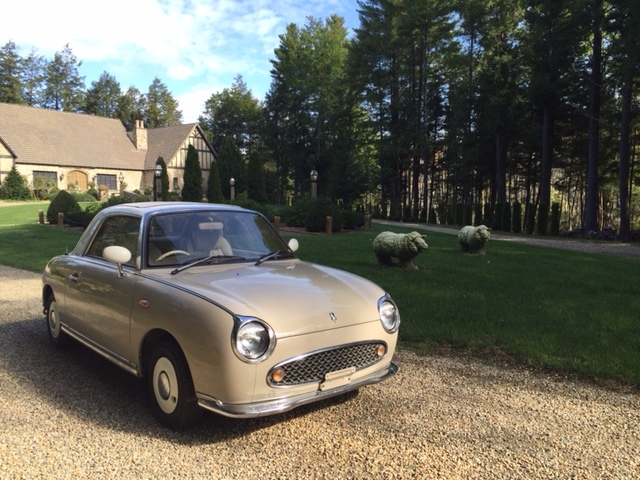 I have been trying to get a Figaro for several years. I saw a few in Canada,but none that didn’t have some rust issues. I really didn’t care about small things that need fixing because I like to tinker with things. I have owned an Instrument shop for 35 years. 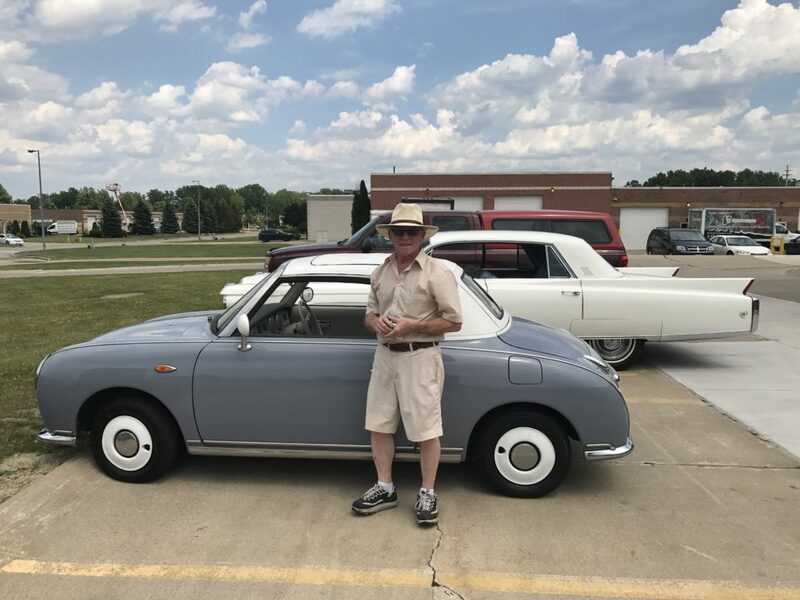 Anyway I came across one that was just being unloaded from Japan through a couple of friends, All original, not a speck of rust, although far from “perfect” but a good driver with 43000 miles and all service records. I could certainly use a Japanese interpreter !!! As far as the air , it is the original r-12 and cools very well. I really like the car and having fun explaining where and when it came from!! 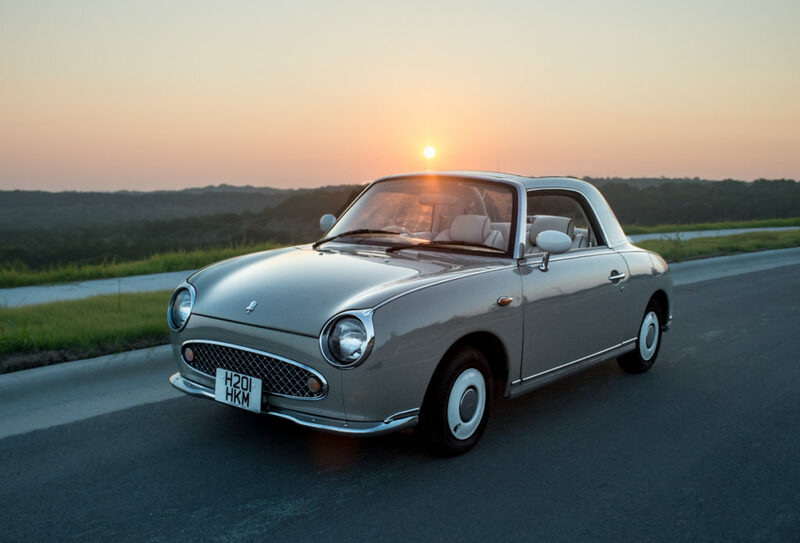 So I have had the Nissan Figaro in the back of my mind since I first read an article about it in my August 1991 issue of Automobile Magazine. 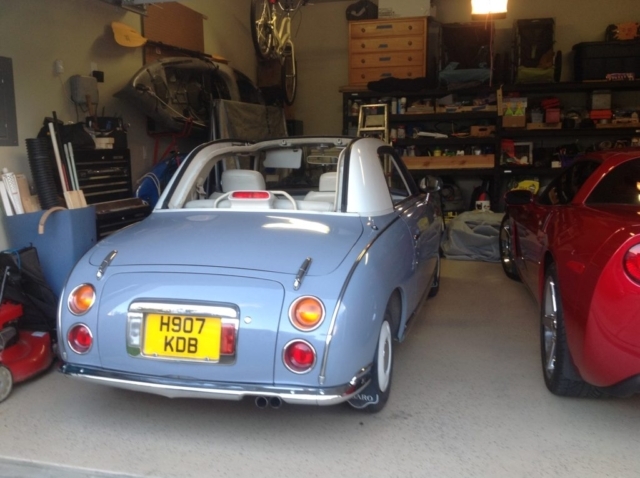 Since then many odd little cars have passed through my garage including three BMW Isettas, a Subaru 360, VW Thing, Renault 4CV, Subaru 360 Van, and many other classics as well. 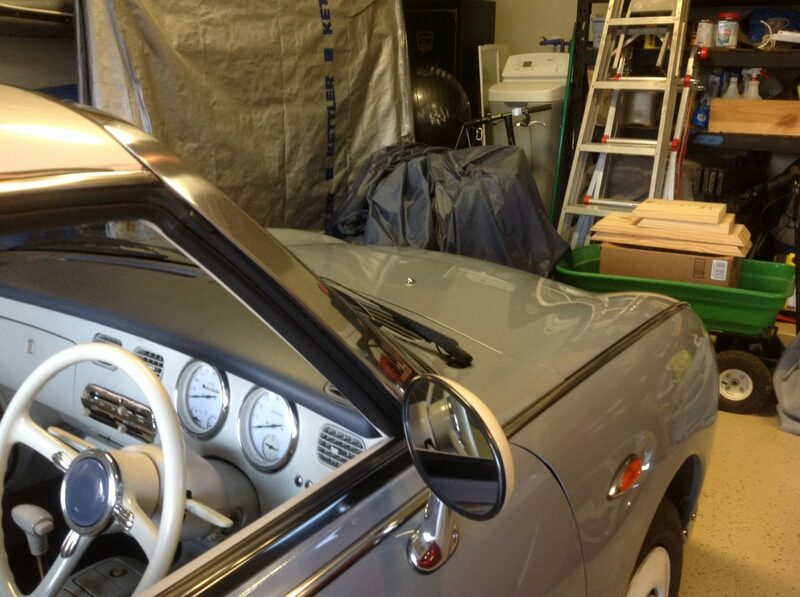 My garage space never allowed me more than one fun car at a time though so it seemed to my wife that it was a constant revolving door of automobiles, which of course it was. 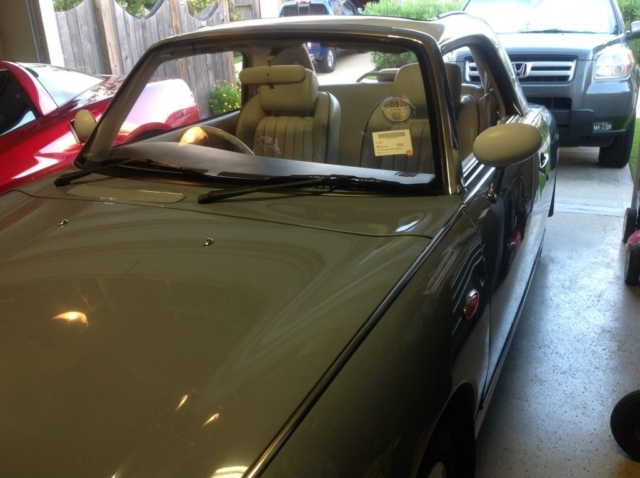 Last year a deal fell into my lap that resulted in my buying a 1991 Alfa Romeo Spider with only 20k miles and in near mint condition, I was able to pay the owner just what a dealer was going to give them for a trade in. This wasn’t a car that was really on my wish list but I could not pass up the deal. 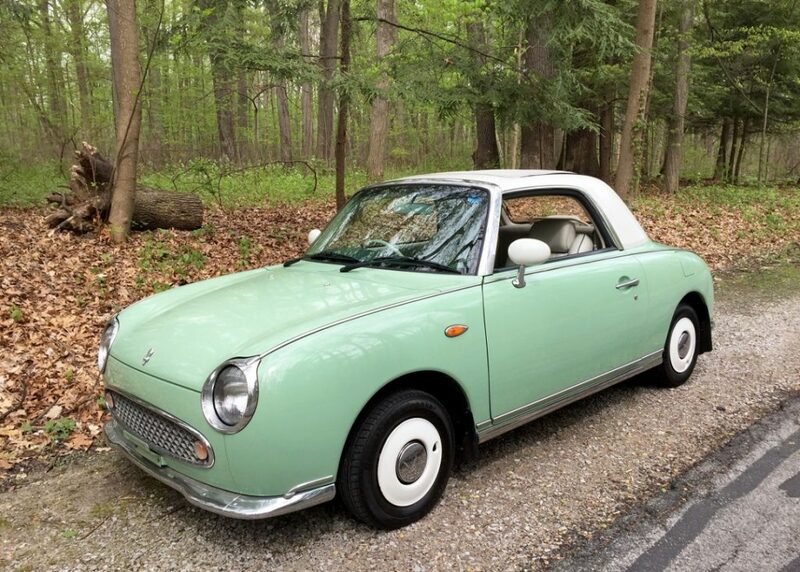 After owning that for a year I was looking to sell or trade it in order to get a restored Nash Metropolitan which has always been one of my favorites, but while searching I happened on a small collector and race car dealer here in Ohio that happened to have this Nissan Figaro in their inventory. 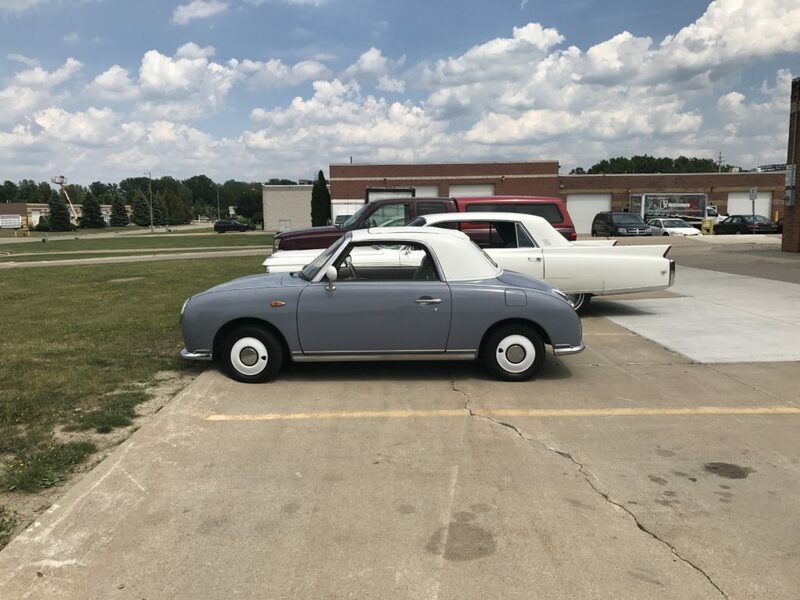 After a few back and forth conversations I was able to trade the Alfa even up for the Figaro and I believe I got the much better end of the bargain. 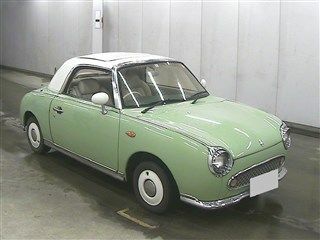 Now I am the proud owner of this Emerald Green Figaro. The body and mechanicals are all in excellent order but the seats have some issues. I have ordered new seat covers from a company in China that makes them for a couple of companies in the UK. I have also ordered a few other bits that will put my car in fairly good shape for next summer. I love the attention it gets and the smile it puts on people’s faces. I even went so far as to have my brother in law make me a set of eyes for the car to transform it into the Denise Beam character from Pixar’s Cars 2. 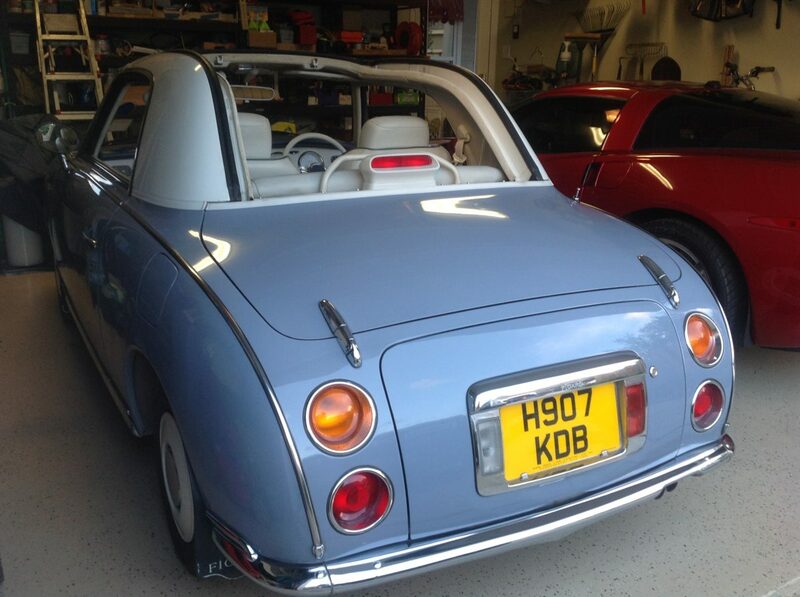 I am even looking into bringing over a nice Topaz Mist Figaro from the UK in the next month or so. I first saw the Figaro on Mighty Car Mods. I thought it was just beautiful. Months later, from my 6th floor office window, I saw one drive by. I wanted one since then. I still have not seen one up close. My friend has imported a few cars from Japan. He encouraged me to get one. So I did!